Before I get to the requests that are rolling in for my 30 days of chocolate campaign for Valentine’s Day, I thought I would fulfill my own request first. I can’t stop thinking about chocolate cookies. 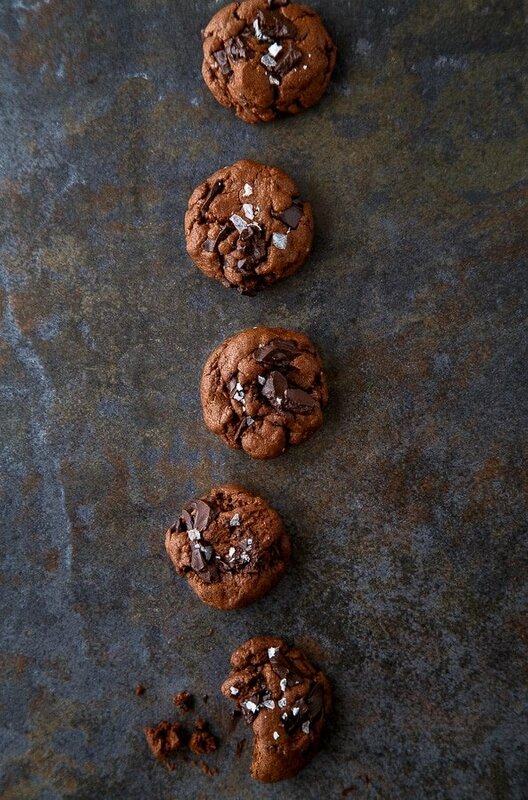 And not just any chocolate cookie—a soft, chewy cookie chock full of melting chocolate chunks. Have you noticed that chocolate chips don’t melt very much in the oven? That’s why I used chocolate chunks for these cookies. The gooey factor was of high importance for my perfect chocolate cookies. I also tipped in some espresso powder because I always love the way it makes the chocolate taste richer and fuller. If you get a chance in life to be richer and fuller, you should always take that chance. That said, it’s entirely optional. Don’t forgo the cookies if that’s the only ingredient you’re lacking. But also, um, don’t substitute coffee grounds. Definitely not the same. I made Chocolate Ginger cookies a few years back that I still crave on a regular basis, but today is all about chocolate. Nothing but the chocolate. In all of its glory. 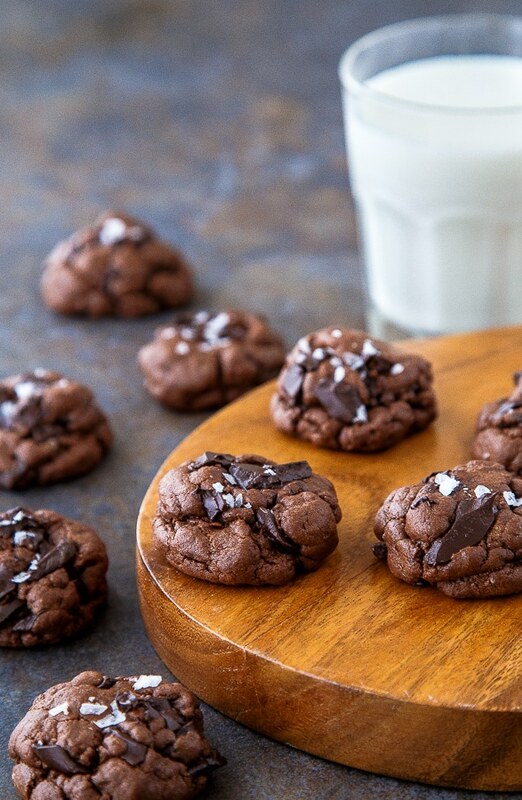 I hope these perfect little two-bite chocolate cookies make all of your chocolate dreams come true. Please, keep your requests rolling in for chocolate desserts for Valentine’s Day! I’m loving all the emails and comments with your ideas. Thanks so much! I can’t wait to get to work! In a medium bowl, beat the butter with an electric mixer until fluffy, about 1 minutes. Next, add thebrown sugar and beat another minute. Add the egg yolk and vanilla extract and beat until well combined. In a separate bowl, whisk together the cocoa powder, flour, espresso powder, baking soda and salt until no lumps remain. When ready to bake, preheat the oven to 350Â°, and spray a cookie sheet with cooking spray (or, line it with parchment paper). Scoop out 9-10 dough balls and roll them in your hands to form a ball before placing them on the sheet. Bake for 8-10 minutes. Check the cookies at 8 minutes--if they smell fragrant and the edges are set, remove them from the oven. Sprinkle with the salt, if using. these should be called “win over your man’s heart” cookies! Yes! The melted chocolate is essential! 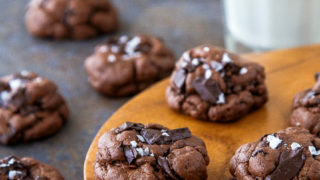 These cookies looks amazing , but how are there no chocolate chips in the recipe!?! these would totally make all my dreams come true – they look amazing!! These look so delicious! Can you share how much chocolate chunks you used and which brand you recommend? I’m not sure why New Year’s resolutions involving cutting out sugar exist when valentine’s day comes so soon after–along with these luscious looking cookies. Drooling! I need this small amount because otherwise I might eat the entire batch myself! Changing my request to these… It’s like you already knew what I wanted. I love the salt sprinkled on top! Hi! Quick question….what type of chocolate did you use for the chocolate chunks? Sorry in advance if I overlooked it in the recipe. Oh yum – these look absolutely amazing. So excited to see all those chocolate recipes!!! These look out of this world!! Right up my alley. Thanks girl! YUM. I think these might just happen this afternoon. Three cheers for chocolate! (and more chocolate! and more chocolate!) And ditto to all the other comments – the sea salt sprinkled on top = perfection! Chocolate, chocolate, chocolate = win-win. This is a fab one for those afternoon cravings! These look so yummy! I will have to try and figure the calories (sorry, I know that word is evil!) to see how many cookies I can fit into my day’s food allotment! If I don’t do the calculations I would eat them all in one day! Need in my life! I am so for 30 days of chocolate. What do I have to do to make this happen?! you had my heart at flakes of sea salt, perfection! Ok I just commented on Stephanie’s Caramel Coconut Cookie post, and claimed that I’m not really a cookie person unless there’s caramel, coconut or peanut butter involved….I think I have to eat my words, because DOUBLE CHOCOLATE, oh boy can I get down with that! These look DIVINE! And I second Christine, flaked sea salt makes all sweets infinitely better. These cookies are chocolate perfection!!! After having a total recipe disaster in the kitchen the other night I needed a success, and since your recipes are always amazing and I just so happen to have all the ingredients (minus espresso powder) in the house, I made these cookies, OMG! Seriously, they were SO GOOD! My entire evening was instantly better! I also didn’t have chocolate chunks but used chips instead, still amazing. I love that they were small batch and I only had a dozen instead of like 5 dozen cookies lol. Such a great cookie, I’ll definitely be making these again for sure! My family would go nuts for these cookies! There’s nothing better than a thick, chewy, chocolate-loaded cookie. Love this! Chocolate cookies are the BOMB! These look fantastic! WOW. These look amazing! Definitely trying these soon. Pinned! Oldies, but goodies. I’m always on the lookout for new and exciting recipes, so I tend to forget about favorites from long ago. Thanks for reminding me to pause and look back every once in a while! I made the batter and put it in the fridge like instructed but they were too crumbly to form into a ball. I double- checked everything and it’s all right. I added the egg white back in and it worked perfectly. Definitely change the egg yolk only to 1 large egg.